I want to try to use a Wiki for kids to create a Make Your Own Ending story, allowing them to map out and craft a story that jumps from wiki page. Still working on the thinking of that one. Since I have moved blogging platforms (from Manila to Edublogs) for my classroom site, I want to try to use the blog even more with my students as writers. I think I will miss the ability to thread discussion but will enjoy the ease of use. We’ll see how the students react to blogging. I intend to try a simple activity this week after an introduction to what a blog is and how you use it, and what responsibilities students have as bloggers. We are being required to pump more math into the heads of our students this year and I would like to find some ways to use technology for projects that support the math curriculum at our school. These two videos are more great intros into two Web 2.0 tools: RSS feeds and Wikis. They are engaging and informative and, well, fun to watch (who can ask for more). They are done by Commoncraft. This post has been sitting in my blog files for months and kept getting bumped for other things so I decided it was time to get it off the floor. 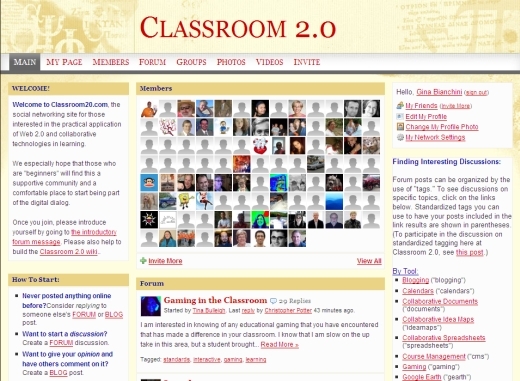 I was reminded of how fast the Classroom 2.0 social networking site has grown since I climbed aboard the Ning train a few months ago (there were just a few hundred folks then in the network created by Steve H.) when the site was featured on the main Ning Blog Page as an example of an active community. I’ve got to believe the classroom is a more fun and productive place when you have teachers who are creatively and passionately bringing social software into the mix. The teachers in Classroom 2.0 are leading by example. So why has “participatory media” become the buzzword at newspapers? ‘Cause they are scared of the real power of the new media. This is a very funny take on responses from newspaper editors and columnists (George Won’t, anyone?) and how they are taking steps to bring more regular Joes and Josephines into the mix (yeah, right).